It was a hard choice to pick an entry for today. 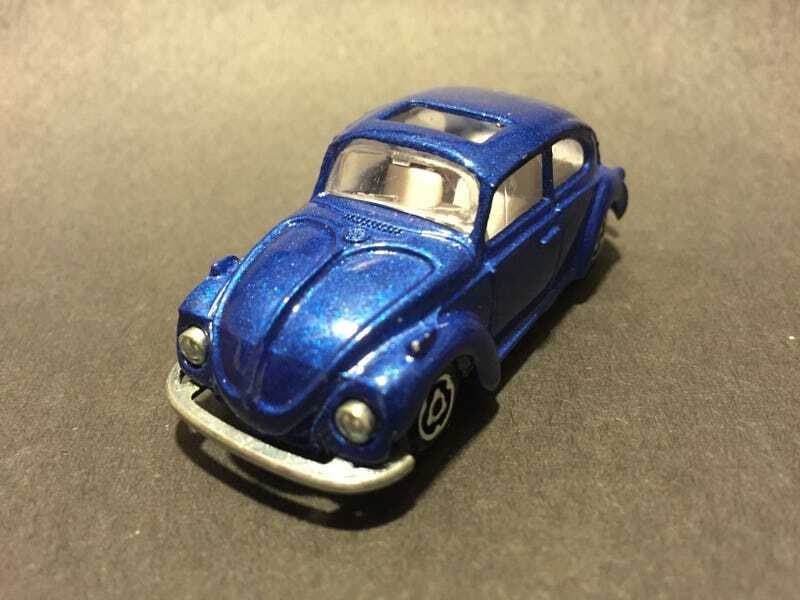 I knew it would be a VW, but I have so many (I also found I have more BMWs and Mercedes than I knew.) As I looked over the choices I had to choose, Golf, Caddy, Bus, Beetle, New Beetle, Baja, or Dune Buggy. I decided air cooled classic would be the way to go. I put aside some nice oval windows and it came down to a nice red convertible (that’s been in the collection from childhood), a red ragtop, or this. When I saw this one, I wondered where it came from, didn’t remember it. Looking it over the detail was what lead me to make the decision. The vent grill and VW emblem on the trunk was nice. Many cars just have a circle there but not this one. The vents behind the back window just added to the detail. Even the badge on the trunk was there amongst the vents. And check out those pipes. The metallic blue paint just makes it shine. Not a fan of the wheels but can’t complain with everything else you get out of this classic bug. Hope you enjoyed the pics as much as I have enjoyed finding this little treasure in my collection.